I’ve linked to a few products that I used from Amazon and those links are affiliate links. This past weekend, I decided I needed some serious ME time! What is a girl to do? 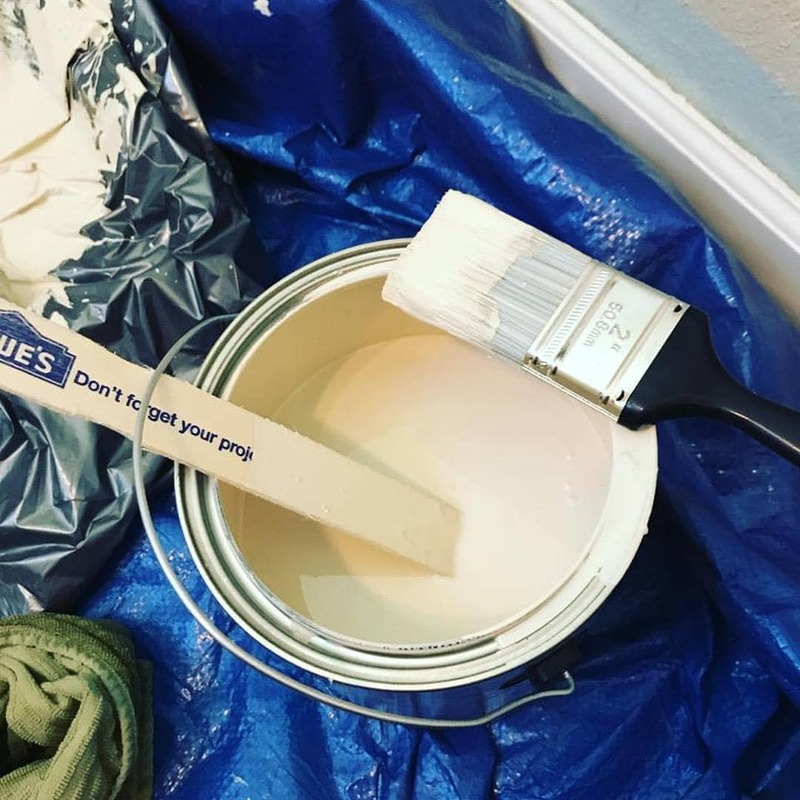 Paint a bathroom, of course! We’ve been in this home coming into 4 years this January and it’s time for painting again. As soon as we moved into our home, we repainted just about the entire house but we were in a hurry. It’s not always good to be in a hurry…why? You may see that you missed the entire section behind the toilet or that your paint is a bit more streaky than you had originally thought. It’s not good for my OCD personality when each time you walk by the guest bathroom, you can see the big spot of paint that is missing behind the toilet. 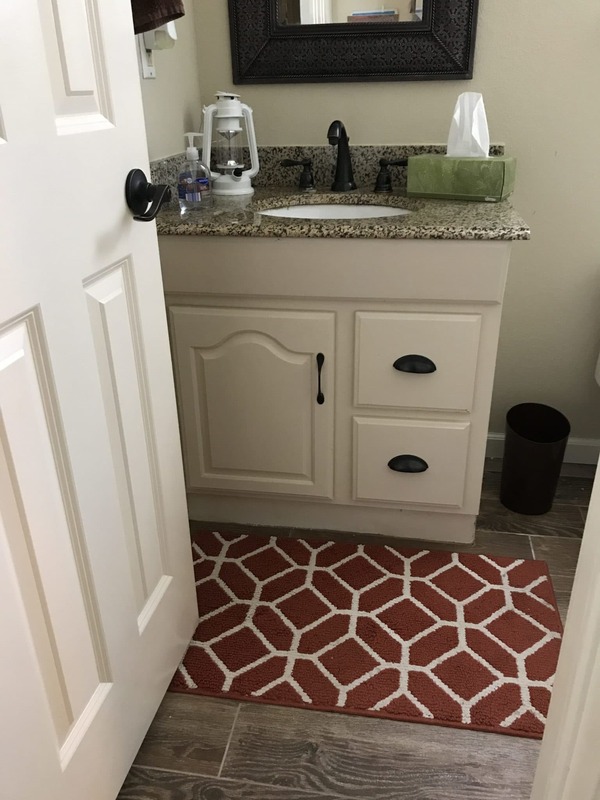 So, I finally (more than 3 years later) got around to updating the bathroom! This will be the 3rd bathroom and the last one to update for a little while. I’ll soon be repainting all the main living areas that have been beat up by furniture over the years. Now, I was on a budget like a I’m squeezing it in budget, so I went to Lowe’s and headed to their mistinted paint section. Guess what? They have some AMAZING colors there! I found exactly the color I was looking for it was paint + primer and it was only $9! Ya’ll that was a $40 can of paint for $9! My budget friendly bathroom was on to a great start. I decided to go by Hobby Lobby to see if I could find something to put on the wall in there too so that I could replace what was originally there, well I decided to let my husband pick out the decor. Was I crazy? YES! Did it end up being okay? Well, if you go along the lines of…always have a statement piece. We certainly have one now! What did he pick out? Bear Claws! 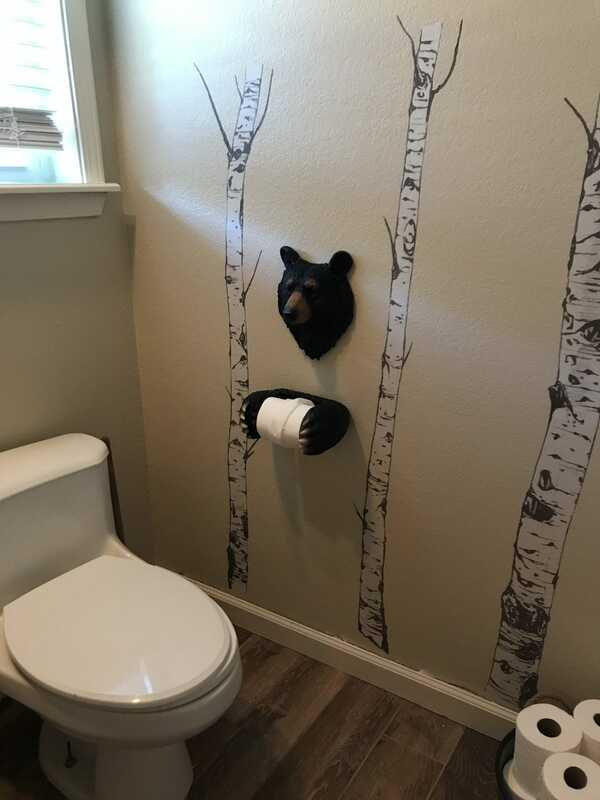 Yes, bear claws now hold our toilet paper and the bear head completes the look. I also added some tree decals, which honestly they ended up being much shorter than I thought so I added a few pictures above it. Then, on the opposite wall, I added some Lake Decor. 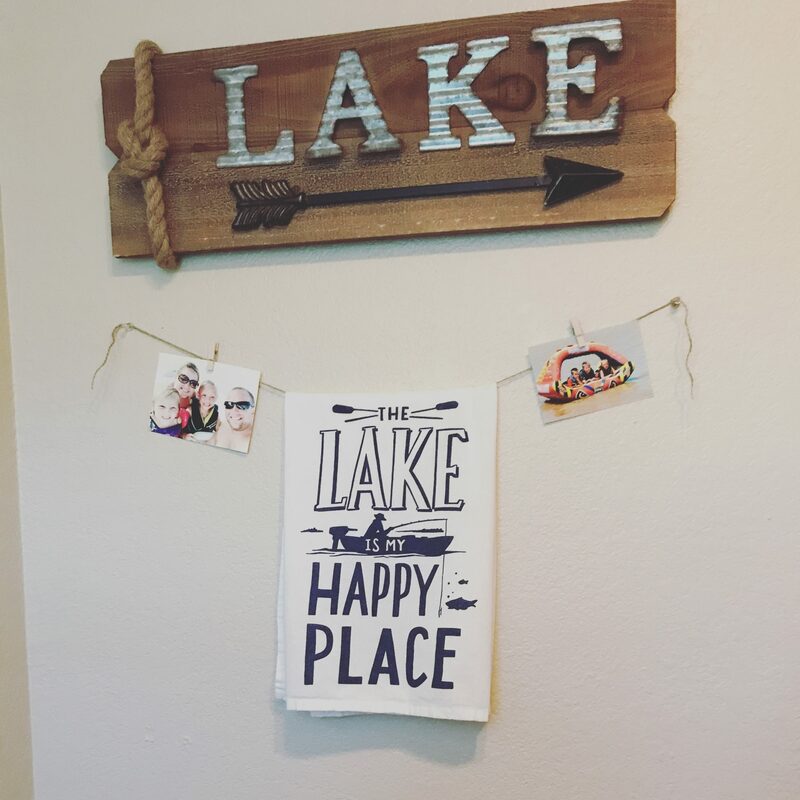 I have always wanted lake decor in our home because it’s like our second home, but never could quite get it to fit the decor of the rest of the house. I finally went with it and added it! It fits because this is the half bath which isn’t really right next to anything else in the house anyway outside of the laundry room. So it worked, plus the paint color went with it all too! YAY! I didn’t have a great before pictures, but it was a sky blue in this bathroom before. 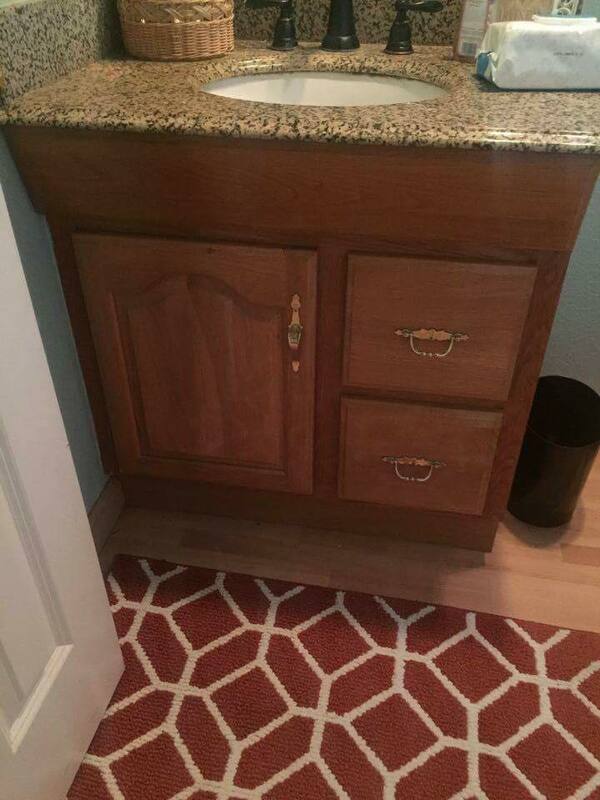 That color was just a bad choice, it didn’t fit with the colors of the countertop. Clearly, I didn’t think it through when I chose it. This one is much better. These particular two pictures above were from last year, when I updated the vanity. I used Rustoleum cabinet kit, which really worked wonderfully. In that picture you can also see that blue color on the wall that really did not go with the countertop at all. Then, we also had the flooring replaced last fall as well. Now, I also wanted a little light fixture to go in there and guess what? 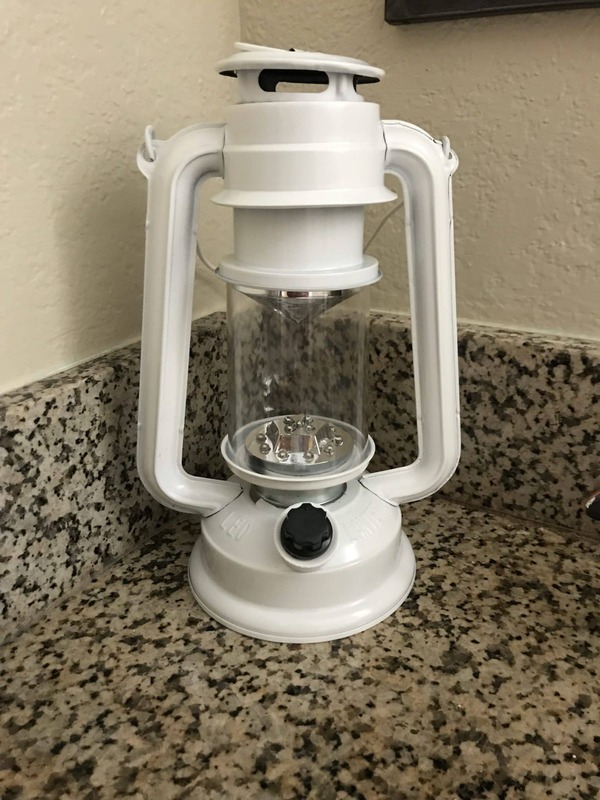 I found the cutest lantern on Amazon to add to it! They come in several different colors and it’s battery powered. I figured it is perfect because now next time we have a tornado come over our house, we will have a light! We can just grab it on the way to the shelter. Yep, genius…or maybe the genius thing would be to actually have a flashlight in the shelter and keep it there. 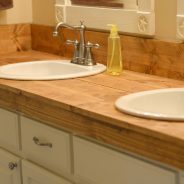 Our bathroom is done for now, and I’m moving on to our upstairs walk through area, which I’m anxious to get done. I’ll be heading back to the store for my discounted paint next weekend! 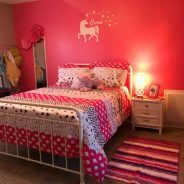 We are a participant in the Amazon Services LLC Associates Program, an affiliate advertising program designed to provide a means for us to earn fees by linking to Amazon.com and affiliated sites.Disclaimer: This post contains links to products that I recommend. Many of those links may be affiliate links. In using those links, it does support the ongoing post and recipes shared on this website. Kristy Still is the creator of Mommy Hates Cooking. A food website that started out of her desire to love cooking. Over the past many years, she's turned it into a passion. She now shares recipes daily that are perfect for all families and taste! Would you like simple, easy recipes delivered right to your inbox?